Columbia-TriStar, fullscreen, languages: English DD 5.1 [CC] & Dolby Surround, subtitles: English, single side-single layer, 28 chapters, "Introduction by Elmo and Bug", theatrical trailers, featurette, rated G, 73 min., $24.95, street date 12/21/99. Directed by Gary Halvorson. Voices of Kevin Clash, Caroll Spinney, Martin P. Robinson, Frank Oz, Fran Brill, Steve Whitmire, Jerry Nelson, Stephanie D'Abruzzo. Elmo loves his fuzzy, well-worn blue blanket more than anything in the whole world. The day doesn't begin until he's said 'good morning' to his blanket, and he never, ever goes to bed without it. They are inseparable-a perfect team, and Elmo has promised Blanket that they will be together forever. He is able to keep his promise until Zoe, Elmo's very best friend in the whole world, picks up his blanket and asks to hold it. Elmo snatches it out of her hand and adamantly refuses. It doesn't matter if it is Zoe, he's not sharing. A tug-of-war breaks out, and neither of them see Telly flying toward them on his new roller blades. He bursts between them, ripping the blanket from their hands, and with it wrapped around his head, continues whirling out of control down Sesame Street. Aghast, Elmo sets off in hot pursuit. The chase ends at Oscar's trash can where Big Bird tells Elmo that Oscar sneezed on his blanket, tossed it into his can and left. When Oscar doesn't return, Elmo decides to take matters into his own hands and jumps into the trash can to retrieve his blanket. At the bottom of the trash can, Elmo finds his treasured blanket snagged on a nail. He tugs on it, and finally, with one giant yank, the blanket, nail and boards all fly off and Elmo and his blanket are sucked down a colorful, swirling tunnel into Grouchland, the yuckiest place on earth. Thus begins a journey that takes Elmo on an action-packed adventure into a fun-filled, far-away land full of grouchy creatures, stinky garbage and the greedy Huxley, who flies through Grouchland in his giant flying machine, The Huxocopter, sucking up everything that isn't nailed down-including Elmo's blanket. Elmo begins to realize that he was selfish not to share his blanket with Zoe. Summoning all of his courage and determination, he sets off to face Huxley to rescue his blanket and make amends with his friend. Since Sesame Street debuted in 1969 - only two years after I made my glorious entrance into the world - I was among the first generation of kids to grow up with it, and it's nice to see that it continues unabated to this day. Ernie, Bert, Cookie Monster, Big Bird - the whole gang are still around and doing well! But what the heck is Elmo? I don't know exactly when Elmo hit the Street, but it was long after I'd learned the alphabet. Hey, I remember when Snuffleupagus was a new character, so I'm clearly well behind the times! Anyway, from my distant vantage point, I may not know much about Elmo, but I do know that he clearly seems extremely popular. Hey, a couple of housewives beat me up to get one of those Tickle Me Elmo dolls a few years back, so I know of what I speak! I guess that's why Elmo gets to star in the latest Sesame Street movie, The Adventures of Elmo In Grouchland. Oh, the whole crew appear; we see all those Muppets I mentioned plus the Count, Oscar the Grouch - in whose native land much of the story occurs - Grover and actual humans such as Bob "Yes, I'm the original cast member" McGrath and Roscoe "No, I'm not the original 'Gordon' but I've been with the show 26 years so give me a break!" Orman. While I may have been among the show's original target audience, I'm clearly not one of those at whom this film is aimed. Nonetheless, Elmo provided a pleasant, inoffensive little experience. It seems well-produced and will likely be very entertaining for the tots. The story is quite bland and offers little to scare them, but even the mild frights or bouts of sadness are leavened by Ernie and Bert, who frequently stop the film to reassure the kiddies everything will work out. That latter technique could have been cloying and sappy, but I thought it seemed sweet. E & B even get in a few laughs along the way, such as when Ernie asks who'd want to see a movie that doesn't have a happy ending; Bert counters with a few notable successes like Titanic. While Elmo doesn't provide a whole lot of fun for adults, it's got enough quirks to maintain grown-ups through its 73 minutes. Actually, I found it to be as entertaining as the more adult-oriented Muppets From Space, largely because it didn't try as hard to amuse that crowd. Some lines are clearly aimed at older folk, and those are decent, but the film remains stuck solidly on its target group. 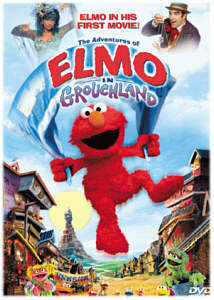 The Adventures of Elmo In Grouchland appears only in a fullscreen version. he reasoning behind this decision escapes me. I guess Columbia Tristar (CTS) figure that the kids in the film's target audience won't care about letterboxing, and they may be right. Nonetheless, I don't understand why they couldn't have included both widescreen and fullscreen editions. CTS do that quite frequently, and there certainly was enough room on this disc, since the film only runs for 73 minutes; even with the extras included, each side would only need about 90 minutes. CTS have long been great supporters of DVD, so this is a disappointing decision on their part. One could argue that letterboxing was not needed because Elmo was soft-matted; as such, that would mean that no panning and scanning was required to present the fullscreen version. That may be true, but I couldn't firmly establish that by viewing the movie. It seemed fairly well-composed on the sides, though some crowding did occur. The most notable example of that happened when Huxley discusses a velvet Elvis painting. The actual artwork is displayed in the lower right hand corner of the screen but is barely visible. Since the gag would work better with the painting appearing more prominently, I doubt this was how it originally appeared. Anyway, I don't like the reasoning that since this DVD is aimed at kids, it should slack off in areas of importance to adults. That's shoddy and vaguely insulting. CTS and other studios should maintain the same standards for all of their DVDs, no matter what target audience is involved. Well, at least CTS did a pretty good job with the transfer. Overall, Elmo looks quite good. Sharpness is always crisp and detailer with few instances of shimmering or jagged edges. The print used seems very clean and displays no grain, scratches or other markings. However, a vague grittiness pervades a fair amount of the film. Much of this seems to result from some not-so-hot special effects; the scene in which Elmo sings "Take the First Step" amply demonstrates that. Whatever the cause, it's there, though not with tremendous frequency. Black levels appear strong and accurate, and shadow detail looks quite terrific. Actually, low light scenes seem the best looking in the movie, largely because they obscure any hint of grittiness. Check out the part where Elmo gets trapped in a tunnel; the blacks are absolutely rock-solid, and the dim lighting doesn't obscure any of the detail in the picture. Colors also are a strong point. The world of Sesame Street is quite colorful, and those hues come across very well. All in all, Elmo presents a strong image, with only a few notable flaws. Elmo offers a pretty decent Dolby Digital 5.1 sound mix. Quality seems good, though the low end generally appears somewhat weak; when the giant chicken attacks Elmo, we hear some nice bass, but other than that, the audio appears a bit treble-heavy. Still, dialogue is always intelligible and reasonably natural; some of Patinkin's lines seem strangely muffled, but those are the exception. Music and effects appear clean and pretty smooth. Elmo presents a fairly active mix, though it's somewhat subdued overall. I'd guess that the sound designers probably didn't want to blast the kiddies with too much stimulation, and that's a good idea. As such, "Elmo" uses all five channels frequently but somewhat quietly. It creates a nice soundfield, however, and helps immerse the viewer into the setting. Elmo tosses in a few pretty ordinary supplements. First up is a fluffy four minute featurette. This is really a glorified trailer with a few interviews included. It's watchable but pretty useless. More unusual is a thirty-second introduction to the film from Elmo and Bug. This is exactly what it says: a brief greeting from those two characters. It's cute but should have appeared at the start of the DVD; it seems odd to have to access it from the special features menu, where it will likely get lost in the mix. Five trailers also appear on the DVD: one for Elmo itself, plus ads for other CTS family movies (Fly Away Home, Matilda, Madeline, Muppets From Space and Jumanji). And that's it. No, it's not a big deal that nothing also shows up on this disc, except for the fact that the case claims Elmo presents talent files and production notes. These are nowhere to be found. The DVD doesn't even include a booklet - which would normally feature the production notes - instead substituting a one-page insert with chapter listings and the cover art. This is one of the shoddiest CTS DVDs I've seen in a long time. From the lack of the original theatrical aspect ratio to the omission of listed supplements, it shows a lack of respect for its audience that I find troubling. The movie itself is pleasant and should entertain the kiddies, and the quality of the image and sound are good, but I still count this release as a disappointment. Official Site--It's disappointing that the site does not have any features that gear toward the young ones; there're no games, coloring pages, or any other downloadable goodies. Instead, you do get a very extensive detail on the making of the film. Sesame Street--You might as well skip the official film site and head straight to Sesame Street where you will find all the beloved muppets and fun activities. Amazon.com--Available to purchase are the DVD at special discount, the movie storybook by James Bridges (recommended for ages 4-8), and the original music soundtrack featuring various artists. Reel.com--Purchase the DVD at special discount.